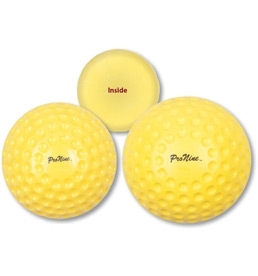 ProNine Dimpled pitching machine practice balls feature a dimpled design for true flight and lasting durability. Official baseball size and weight, these pitching machine balls are perfect for any machine that uses regular balls or machine balls ( Atec, Jugs, BATA, Sports Tutor, Iron Mike, Heater and commercial machines). 3 - 5 5% $27.70ea. 6 - 9 10% $26.24ea. 10 or more 12% $25.66ea. Regulation size & weight. Perfect for any machine that uses baseball size pitching machine balls ( Atec, Jugs,BATA, Iron Mike, Heater and commercial machines). Stingless construction so that aluminum bats are not damaged yet the performance is true. Hard machine balls are not recommended by any leading aluminum bat manufacturers. Optic-Yellow is the preferred machine ball for practice. Dimpled for outstanding accuracy with every pitch. Feels like a leather ball when hit. Same dimensions and weight as a regular leather baseball. These balls are not suitable for Lite-Flite, Pitch Master, Mound Monster or Hitting Streak/Power Streak machines. Very good product, must softer than the old jugs balls we used to use. Does not damage bat and can be used with wood as well. Great quality. Tried them on a cold day and no kids ended up with stingers. Gave them the confidence to swing thru the ball. Very accurate out of the Heater BaseHit pitching machine. The balls come out of the machine straight and true. Hitting them feels no different than the real thing. Great product, glad we purchased. Takes a lickin' and keep on hittin'. Great sound & reaction off the bat.